Commissioned by Josimar Magazine to illustrate the cover for their 200-page World Cup issue, New York City-based designer, illustrator and art director Daniel Nyari willingly assumed the mantle with both hands and set to work on producing a retrospective of epic proportions. Opting for an unabashedly colour intensive exploration of over seven decades of unforgettable World Cup fame and infamy, his cover design illustrates the history of the world’s most beloved sporting occasion like it has never been seen before. Daniel sat down with These Football Times to delve just as deep into the origins of this particular project, the constantly evolving role of social media in the modern game and the art it inspires, and so much more. 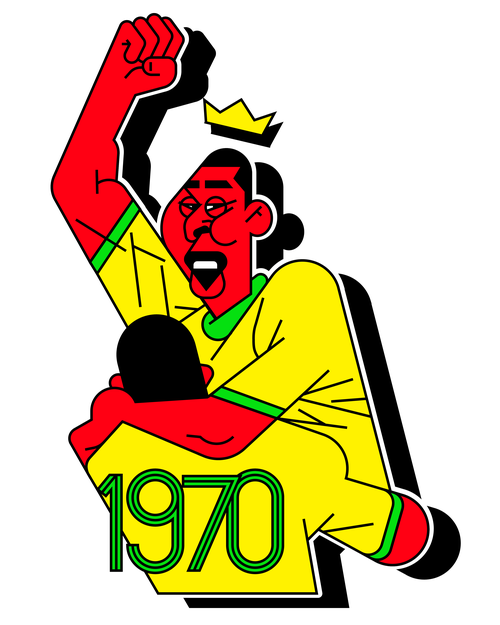 The illustrations for your Moments In World Cup History 1930-2014 project are so stark, with such boldly defined shapes and incredibly vibrant colour palette, and boasts an incredibly playful, often comic-like humour. Do you feel this style better helped you to confidently define what you call the tournament’s “tapestry of its significant moments” given that there are so many to choose from? What exactly inspired this particular visual approach you took with your World Cup project for Josimar Magazine? “The virtual space has swallowed up all previous media types into itself and formed a new environment waiting to be unconcealed. We have radio, television, movies, theatre all in one virtual space, now in the form of podcasts, YouTube, which is essentially a movie/TV archive, streaming and social media, which, much like theatre, is very performance-spectator driven. If we’re not live-streaming matches, we’re tweeting and texting about it, posting our reactions on social media. 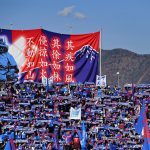 There is no shortage of ways in which how you can absorb the game and events around the match it has become as important as the match itself. This is in stark contrast to football culture pre-internet, where the entire horizon of its world wasn’t available instantly. “Consequently, information absorption and sharing in this space has the formal characteristic of a modular, liquid, groundlessness rooted in a decentralization choice. Everyone can now build their own educational eco-systems. For example, suppose you’re looking at videos of the Brazilian Ronaldo on YouTube and you learn about his narrative from the failure of 1998 to the redemption in 2002. Algorithms will likely next take you to videos about 1950s era Brazil or even something from an entirely different era. Online, there is no ordered way to learn beyond what you decide is the right way. With this kind of liquid learning, context is no longer as important because learning is no longer even linear. “In this new world, what you end up with is always an aggregation of images and text that make up an entirely subjective sign regime. This unique process codes your understanding of history very differently than it does for someone else. It’s a world of modular surfaces that are always on the move, rub up against each other, can congeal, separate, multiply, disappear, etc, but ultimately always results in personalized planes of signification. Your project does an exceptional job of highlighting the immense highs and lows of previous tournaments. Could you tell us a little about the procedure behind making these pieces for the project and how you choose which exact moments to illustrate? “That took up most of the time. I began by compiling a list of archetypal narratives that usually emerge in World Cups and become more or less ingrained in football folklore. Among these narratives are surprises, upsets, off-pitch entertainment, media changes, records, politics, superstars, tragic heroes, moments of humour, moments of violence and so forth. “I’m interested in how internet search engines like Google Images, YouTube, and Wikipedia codify history. They’re our go-to tools for learning anything these days. 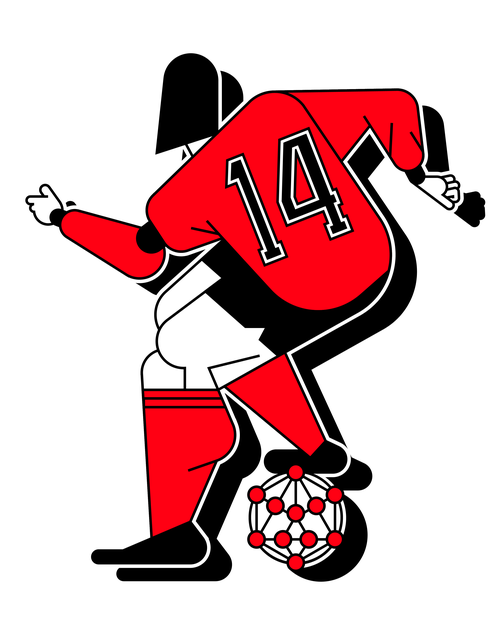 For example, Googling ‘World Cup 1974’ will yield rows of images of Beckenbauer lifting the trophy, the Dutch squad, the logo, but not the Cruyff turn which, for me, has always been the lasting image of the tournament for reasons that it was spectacular, innovative, and captured the essence of Total Football, which had an immense ripple effect on football since. 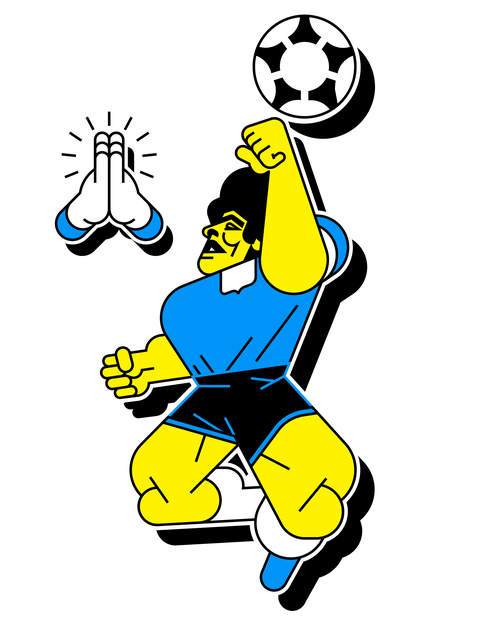 “Googling ‘World Cup 1986’, on the other hand, will yield plenty of images of Maradona’s Hand of God. which is the lasting image of that World Cup. What the algorithms place at the top of your search will be what most people will see when they search for those specific terms and, because our brains tend to place extra emphasis on things that are immediately present, we will mentally recall these images more regularly whether they are iconic or not. They can become iconic simply because they are iterated more and they inscribe themselves onto our visual memory. 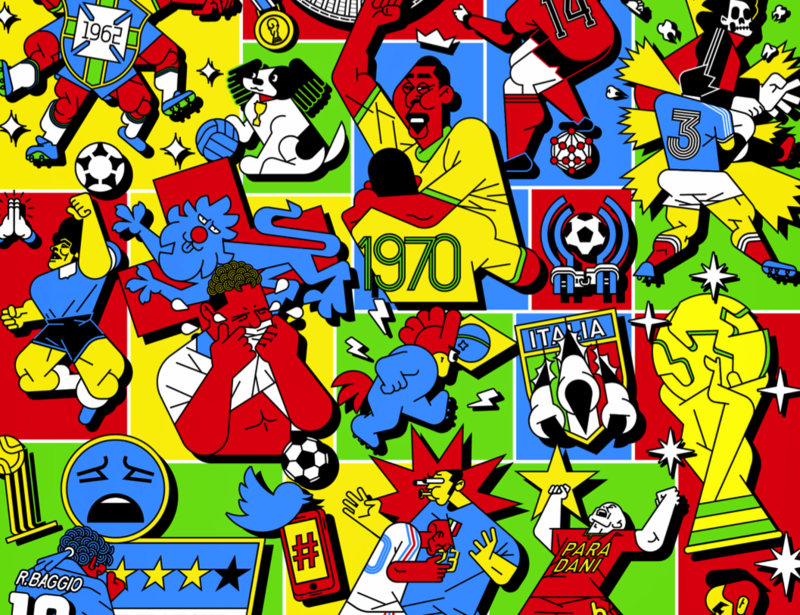 For any football fan, a commission that encourages you to illustrate an entire history of World Cup moments must be a dream come true. 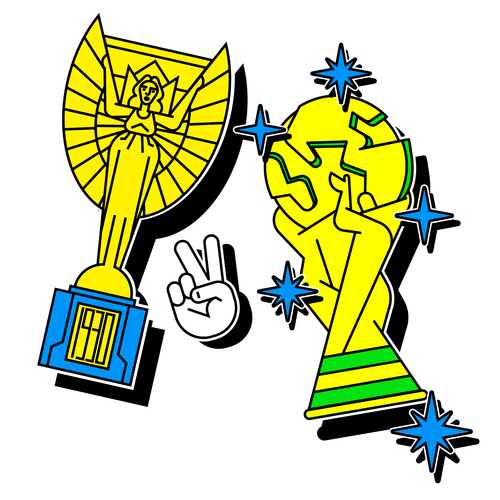 Which was the first World Cup you personally remember, what are your persisting memories from it, and were you able to resist putting them into this project? 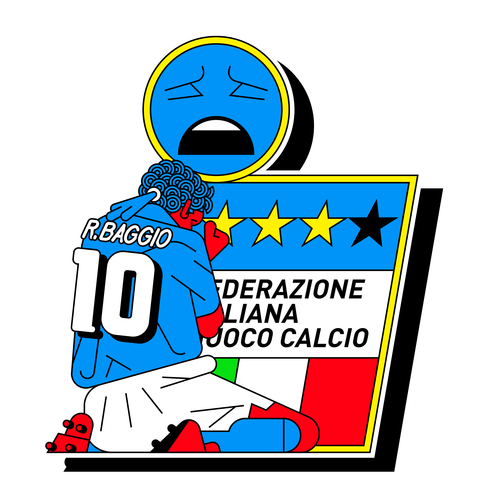 “The first World Cup I remember was Italia 90. I was only four years old and what I remember most is receiving a little keychain of Ciao, the mascot. I loved it. I loved the combination of cube edges, the curve of the head and how simply it was designed: just a bunch of cubes and a ball. It’s something I could recreate with my own toys and it’s very likely that it had an influence on my aesthetic sensibilities. “As for the tournament itself, I don’t remember any of the games but, growing up in Communist Romania in the Soviet Bloc, I specifically remember the conversation about the political significance of West Germany winning after the wall came down earlier that year. West Germany’s win was accompanied with an atmosphere of celebration in my imminent environment. Having inevitably trawled throughout the entirety of the tournament’s storied history to research and relive its most compelling moments, there can’t be many you aren’t familiar with. If you had to choose just one moment to represent the World Cup, which moment would you choose? And what moments do you foresee – or perhaps hope to see – at the 2018 World Cup that may later demand you illustrate them years from now? “I can’t really just pick one. The reason the World Cup is so special is because it’s a competition that aggregates and condenses multi-variable narratives into one short period that plays out on the largest stage. It’s like an adrenaline shot. 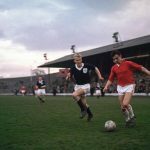 It’s more commonly accepted that the Champions League has overtaken the World Cup in quality and difficulty and that’s perhaps true in this era but the historical prestige of the World Cup endures because of its limited appearance and that kind of scarcity always creates antifragility to historical depreciation. A player’s career is quite brief. Some are only lucky to be able to appear in one or two World Cups. “Team cycles are also quite brief. World Cups are unique snapshots of moments in time where players or teams are at their peak, some just coming up, some at the tail-end of their career cycles and others awaiting their great moment. There is still quite a lot of randomness that makes it all exciting to watch. All these micro-narratives converge together at World Cups while entire nations rally behind them. If there is any moment that represents the World Cup, it’s the congealing of different national identities, hopes, dreams, nightmares into one short month. It’s always the tapestry this all forms that makes for the best moment. “This year is no different. While it’s trendy to downplay the importance of international football and national identity these days, we see how important it still remains to nations like Italy, Chile, the Netherlands, Ghana, Ivory Coast and the United States, all of whom failed to qualify. I hope to see many of the same narratives I highlighted in my Josimar cover emerge. In terms of your physical art processes, do you spend a great deal of time sketching out your ideas before bringing them to life on the screen? “I don’t really do sketches, just very rough little icons with a lot of written mental notes for when I build the shapes out into wireframes. When I build them out it’s very improvisational and mostly based on reference photos and mental images. That seems to be the process that works better for me as I’ve found out in my career. All I need to do is lay down basic shapes and then I duplicate, mix and match ‘till shapes congeal and click into something I feel like works. Are there any particular past projects of yours that fans of this one would most enjoy finding? Thanks to Daniel Nyari for speaking to These Football Times as part of The Gallery. If you’re an artist for whom football remains the ultimate muse, and you’d like to feature in The Gallery, please email us with examples of your work.